The British Shorinji Kempo Federation (BSKF) has been overseeing the teaching of Shorinji Kempo in the United Kingdom since 1974. 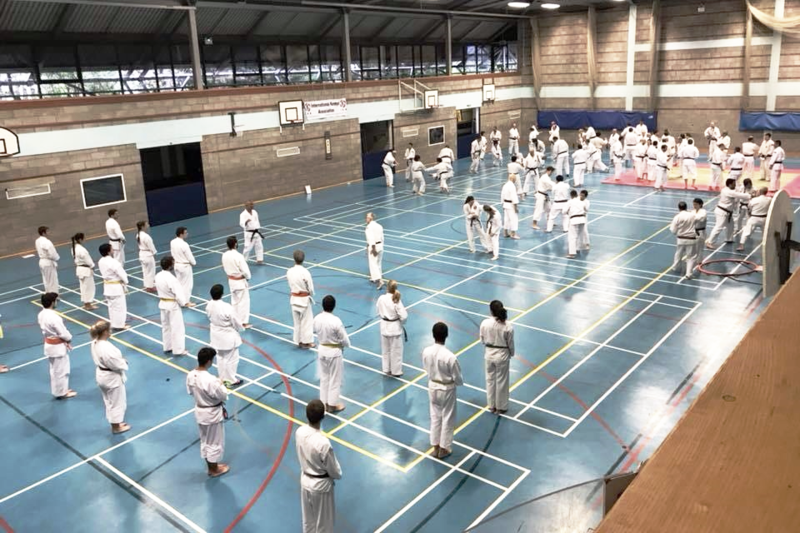 Since the arrival of Sensei Tameo Mizuno in the 1970s, the organisation has continued to develop, and in its current form has clubs operating all across the country. The BSKF is a founding member of the International Kempo Association (IKA), which was set up to encourage close and friendly links between groups teaching Shorinji Kempo across the globe. What makes Shorinji Kempo different? Many martial arts take a narrow focus, whether on striking, on standing throws, or on ground-fighting. Shorinji Kempo however comprises both hard and soft systems (striking and grappling). One of our fundamental principles is 'hard and soft form one whole', meaning that ideas from both systems are combined in each technique, and at higher levels, the systems flow together seamlessly. Through training in Shorinji Kempo, you will come to appreciate the range of ways in which you can effectively defend yourself. Those teaching Shorinji Kempo do not believe in acquiring martial skill without appreciation for the reasons why this is being pursued. Students of Shorinji Kempo are encouraged to pursue two goals: develop yourself, and help others. Fighting for fighting's sake is against our ideals, but using your training to build confidence and improve your ability to stand up for those in need is firmly in line with our thinking. Through training in Shorinji Kempo you will gain leadership skills, develop strong friendships, and foster the will and means to improve the world around you. The techniques of Shorinji Kempo are designed to help anyone stay safe, regardless of body type, fitness level, or age. The art avoids extensive conditioning, strength training, or techniques that rely on raw power or athleticism. Instead it uses scientifically-grounded principles of balance, leverage, momentum, and accuracy so that with training, a defender can overcome a larger, stronger aggressor. Through training in Shorinji Kempo you will learn how to use your body to its best potential, whatever its individual properties, and acquire enduring skills in self-defence that will serve you throughout your life. The BSKF is proud to be a founding member of the International Kempo Association, or IKA. This organisation was founded in 2015 to foster greater friendships and collaboration between groups studying Shorinji Kempo and related martial arts in different countries. ​The BSKF is joined by federations in Japan, Italy, Czech Republic, Spain, Switzerland, and Ireland in a friendly and cooperative association based on shared ideals. Students of the BSKF can enjoy the benefits of expert instruction from members of its partner federations both individually, when visiting other countries, and collectively, during the annual IKA seminars - each of which is hosted by a different member federation.